Your regular columnist, Steve Lenius, is pleased to introduce Rick Burgess as this issue’s guest columnist. I first met him when he entered the Mr. Minneapolis Eagle Contest in 2007, and captured the first runner-up spot. Later that year, when I heard he was a pledge, or provisional member, of The Atons, I asked if he was interested in writing a guest column about his experiences and adventures on the way to becoming accepted as a full member of the club. He agreed, and here’s what he wrote. He now is not only a full member of The Atons, but also the club’s Secretary for 2009. 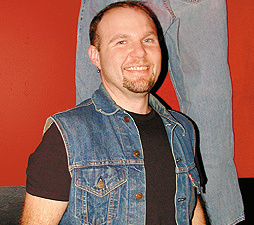 He is involved as well with Minnesota Leather Pride. In October 2007, I submitted my application for membership in The Atons of Minneapolis. It is one of the oldest active gay men’s Leather/Levi social fraternities in the country. Never having been in a fraternity, I wasn’t sure what to expect. I was accepted as a pledge at The Atons November business meeting. The pledge period lasts a minimum of three months, but it is not over until the club brothers say it is. Pledge Master Del was instrumental in making sure I was a good pledge. The pledge period is meant to give the existing full members an opportunity to get to know the new pledge. My first major event as a pledge was the annual Holiday Fund-raiser in December at the Bolt Underground. I was the official “gopher” for the evening. As a special bonus, the Trustees of the club set up a special raffle involving the pledge—they were selling tickets for the paddling of the pledge at the end of the night. Unknown to the pledge, the number of tickets sold determined the number of swats. Once it was all said and done, there I was, front and center, to receive my 42 swats. Later in December, because it was the holidays, the same Trustees had another special treat. This time, it was tiny jingle bells on clothespins. [Although your humble columnist was not present for this, he is pretty sure the clothespins were not clipped to the pledge’s clothes, but instead were attached to the pledge himself.] But that was just the beginning. Once the clothespins were on, it was time for pledge to sing “Jingle Bells,” and make the bells jingle in rhythm to the song. As the months rolled on, I spent time getting to know each of the members. This included coffee, dinners, and afternoons hanging out to talk and learn more about each of my soon-to-be club brothers. At the same time, it was an opportunity for the brothers to get to know me, and make their determination of whether they wanted to have me as a new club brother. February brought the annual officers installation banquet, held at Pi. Of course, as with the other events, the pledge had a special task. During the banquet, it was my job to get to know members of the leather community who were present, then serve them, making sure they were well-cared-for, and had all they needed or wanted. The catch was that I was to do it in nothing but a thong and boots. During my time as a pledge, The Atons agreed to sponsor me to go to the Mr. Midwest Leather competition in St. Louis, Missouri, where I was the second runner-up. The group also decided to assist in my fund-raising for the Minnesota Red Ribbon Ride, adding $240 to the amount raised for the ride. In April 2008, I finally was accepted as a full member of The Atons of Minneapolis. Since that time, I have become a more active member in the leather community, participating in Minnesota Leather Pride, and the unveiling of the new giant leather pride flag at the 2008 Ashley Rukes GLBT Pride Parade. In 2009, I am serving as The Atons of Minneapolis Secretary. For information on becoming a member of the group, contact me at secretary@atons.net.